A new book from Theo Chocolate goes all the way with cocoa. a visit to the Theo Chocolate factory in Fremont always ends with a serious need to take those heady, cacao-cloaked aromas and flavors home with you. Now, after nearly a decade, local bean-to-bar organic-chocolate pioneers Debra Music and Joe Whinney have released their first cookbook to help home chefs re-create everything from fig fennel ganache to the Big Daddy marshmallow bar. However, Theo Chocolate: Recipes & Sweet Secrets from Seattle’s Favorite Chocolate Maker (available September 22 from Sasquatch Books, $24.95) is much more than a how-to. The book helps to deepen one’s relationship with chocolate (we didn’t even think that was possible). You’ll learn, once and for all, how to master the art of tempering with the right tools (a silicone spatula and digital probe thermometer); pair chocolate with beer and even with cheese; and uncover 75 sweet and savory recipes from some of Theo’s top chef supporters, including Tilth’s Maria Hines, Westward’s Zoi Antonitsas and Hot Cakes’ Autumn Martin. Wallingford for a fresh start and to launch North America’s first organic, fair-trade chocolate factory. 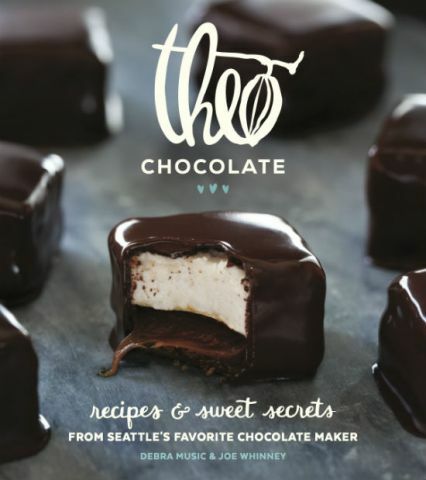 In tandem with the book’s release, Theo will launch a new line of organic baking bars (at Whole Foods and other retailers), allowing cooks greater ease in re-creating chocolate delicacies at home. In addition to sweet favorites, such as Dark Chocolate Stout Cake, there are surprising savory recipes that will change the way you think about chocolate, from hummus-transforming cocoa-scented Dukkah to a Tom Douglas roasted chicken that gets its warm earthiness from cocao nibs. Also included in its nib-studded pages is the emotional story of how Music and Whinney—divorced parents who shared a passion for sustainability—moved cross-country with their son and lived together in Wallingford for a fresh start and to launch North America’s first organic, fair-trade chocolate factory.